I started writing a post about the remarkable In the Night Kitchen a few years ago. It sat in the draft queue and languished while I finished my dissertation. I had grand plans to make a milk cake. But since I’m just not that interested in baking in the day kitchen — and the book was far more complex than I had remembered — it sat. Until today, when we mourn the death of Maurice Sendak and the long afterlife of his rebellious, courageous, playful and inquisitive little heroes. I had got stuck on what I found offensive in In the Night Kitchen, the big flaw in the children’s book as I saw it. I’m in the milk and the milk’s in me! God bless milk and God bless me! And there, suddenly, God makes his entrance. My question as an atheist and a truth-seeker is, suddenly, this. How would one explain to a child this unnecessary turn to this new character at the moment of truth, a child unfamiliar with the concept of God? I realized that Sendak’s writing often pulls a stunt like this that keeps his characters from meaning any one thing or appealing to any one child or parent. Often naughty and unrepentant, the boys and alligators and monsters and all too occasional girls yell at authority figures and refuse to be cowed by anyone, even if they were clearly in the wrong. A lion needs to do more than merely eat Pierre, for example, to get him to care. Only regurgitation, a rebirth from the pit of lion stomach hell, can convert him to returning the love of his (what we’d now call co-dependent) doting parents. Eating functions as a constant in Sendak’s mythology. Kids demand certain foods and make it for others. It’s a crux of power, an essential currency for love and autonomy. He loved it so much he ate it. It’s almost like a joke without a punchline or a terrible truth for someone unconvinced by digestion or perhaps a Catholic: How do you keep a Wild Thing forever? Eat it. Likewise, in their chaotic imaginary worlds, Sendak’s boys ascend to power and threaten the forces against them by denying them food or telling them they’ll be eaten up. One might think, if one were to stop there, that Sendak thought it was a dog-eat-dog world, where boys needed to either consume or be consumed. I’m not the milk and the milk’s not me! I’m Mickey! Milk in the batter! Milk in the batter! We bake cake and nothing’s a-matter! If the chefs are Nazi exterminators, the “morning cake” easily transmutes into “mourning cake,” the night kitchen the long night of diaspora and the blind eye of discrimination. Instead of taking himself and the milk away from the night kitchen, escaping, he becomes something edible, and it’s the very thing he took pains to distance himself from earlier. Now he is immersed in the milk, both inside and outside, and moreover, it’s all blessed and sharable, even with the creatures that want to destroy him. That’s something beyond allowing a child to identify with triumphant Mickey, the one immersed in the nightmare of history, the one who refuses to become a cake and challenges any scary, unjust, or immovable institution the chefs represent. Throughout the book, we can’t help but think of Mickey’s outside and inside, his body and the consumption that he undertakes and delivers. Yes, the book teems with sensuality — not the weird timid pedophilic touch feared by the censors, but sensuality in the non-sexual realm of tactility and texture. It’s about bodies and what your senses can experience. The boy falls out of his clothes and into liquids of various sorts that morph and change and engulf him in tastes and smells and feelings as he ventures off into the unfamiliar. Sendak’s books often do that. My favorite of his little verses, “Chicken Soup with Rice,” puts the soup in the mouths of children but also turns the children into birds stirring soup in their nests, and then into vessels containing the soup. We are made out of the same elements as the water, air, land — everything organic. And because of that, we can change into whatever we like, eat and be eaten, turn ourselves upside-down or inside-out. We can become and unbecome our enemies and foodstuffs, in the most elemental and visceral ways recognizing our difference and our commonality. It’s blessed to transform. I’m in the milk and the milk’s in me. Previous Article spring vegetables say hello, locavore! I loved this book as a child but never thought about the Hitler-crematoria-Holocaust references that are now so bluntly there. I enjoyed Sendak’s gruff final two-part recent interview with Stephen Colbert. Also, interesting that the naked Mickey appears uncircumcised in the images. Maybe that bothered some censors? I just bought my 21-month-old In The Night Kitchen, as well as the Nutshell Library and Where The Wild Things Are. It’s weird to revisit them as an adult–as you imply, there’s a lot of slightly unsettling stuff going on. But I truly live the weirdness. To me that ability to capture the dreamworld, which is how I read Night Kitchen and Wild Things, is what makes Sendak appealing to kids. My son is obsessed w Mickey. He’s too young to express his dreams or fears or what he imagines, but just as Roald Dahl acknowledged the scary and brutal side of childhood, I love that Sendak taps into their weird imaginations. When we are both Very Old I will point to *this* and tell people I knew you. …and now I must make you a milk cake. Dammit. Aw, thanks, SJ. I’m glad someone likes this post as much as I do. Now I must eat your milk cake. I just thought this was such an insightful, well written observation. Well done. As a newly outed atheist, I loved your truth and honesty. Thank you. Latepass, but I just wanted to comment that “I see the moon, the moon sees me, God bless the moon and God bless me” is a children’s rhyme that has carried on from the 1700s. This little reference would be immediately recognizable to anyone who had heard it, and I think would very fittingly be said and heard by this little character, who is so fresh and original, but also very much a child. 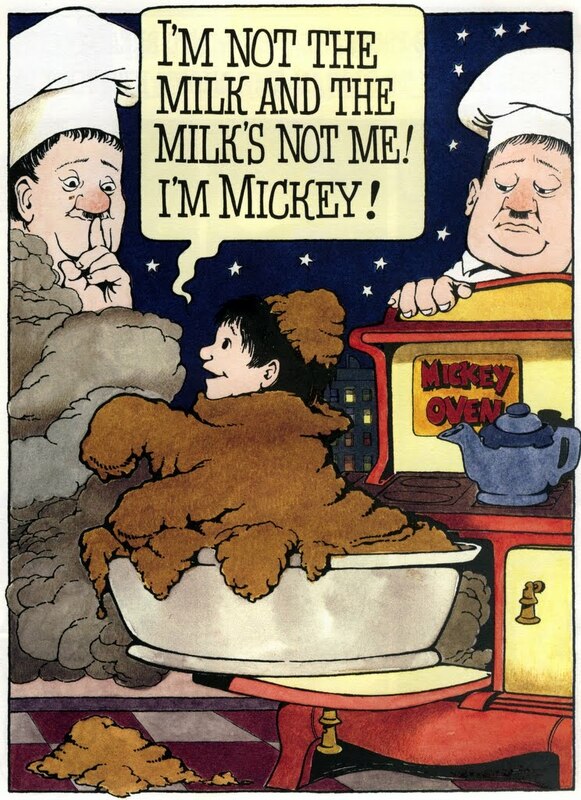 Sendak also could be further playing with the idea of “slipping a mickey” (to add something that shouldn’t really be there)–both to the original phrase and to the book itself. Looking at the image, it states the Mickey is “singing” and there is a tongue-in-cheek moon right in between the two pages, watching Mickey change the words to “its” song. Just wanted to let you know, I think there is much more simple reasoning behind the choice to reference this, as opposed to Sendak himself intentionally writing in a God moment. Thanks for your thoughts, Britta. I didn’t know the rhyme and it’s good to have that background. It doesn’t change the sudden jarring appearance of God, though, especially to a non-believer that still needs to explain it to kids. Some of the older versions of the “I See the Moon” poem have lines asserting the grace of God enveloping and saving all, including humans and nature — a very Christian sentiment. This works quite well with my interpretation, and if there were any Christian sentiments I’d support, it would be the idea of grace. 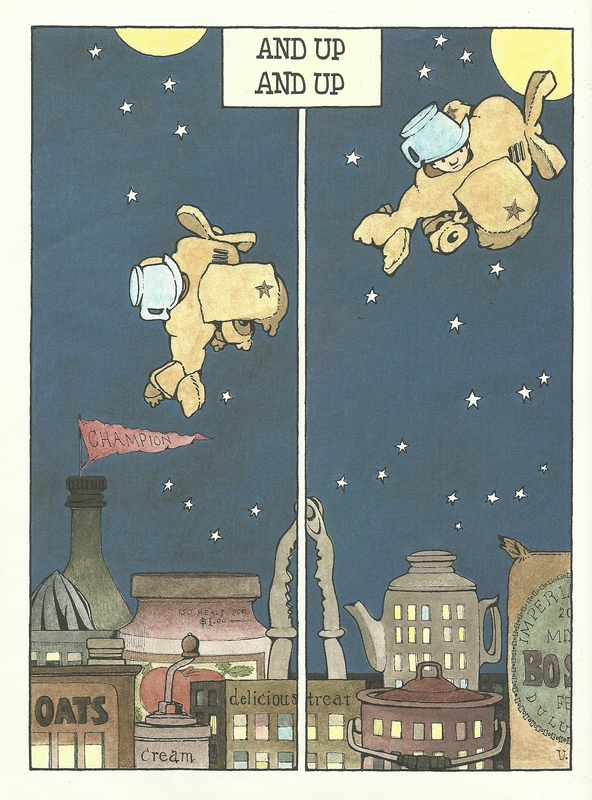 Not sure I understand your interpretation related to Sendak “slipping a mickey,” but it does work as wordplay!